I preached this sermon on Sunday, Dec. 13, 2015 at the Unitarian Church of Lynchburg. Good morning, I am so glad to be with all of you this morning! Our story this morning is about true events that happened in Billings Montana. A number of people affiliated with hate groups moved into Billings. They started harassing people of color, Jewish people, anyone who was different than them. They sent hateful mail. Some of the people in the town felt that the groups should just be ignored, that giving them attention was what they wanted. Others felt it was important to speak up and stop the incidents that were occurring. Those who wanted to respond and stop the mail and the harassment started doing community teach ins where they educated people about what was going on and how to respond. One night during Hanukkah, some of these people started throwing rocks at the synagogue and into a home with a Menorah in the window. The rock went through the window of a little boy and landed on his bed. Fortunately he was not in it. No one was harmed but the little boy was very scared. His family, the police chief and a lay woman from one of the Christian congregations all rallied around. The woman, Margaret MacDonald, remembering a story of a Danish town during World War II, encouraged everyone to put menorahs and pictures of menorahs in their windows. And the people did. Shops, homes, all put pictures of menorahs in their windows. The local newspaper ran a full page picture of a menorah that people could cut out and put in their window. Now the little boy was still scared but he put his menorah back in his window too. On the night of the Hanukkah service at the synagogue all sorts of people turned out, so many that they could not all fit in the building. Many people stood outside the synagogue ready to protect it and the people inside should it be necessary. Thank you so much for inviting me to be with you this morning! At this time of shortening days and long nights, we are blessed with an abundance of celebrations of light – Advent, Hanukkah, Solstice. All of them put at the center the lighting of candles – to remember, to acknowledge and to celebrate both the darkness and the light. 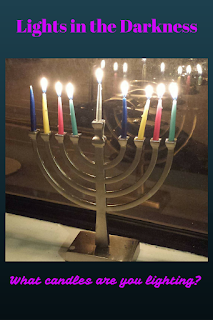 Right now Advent and Hanukkah overlap, as we begin the third week of Advent and the eighth day of Hanukkah. Both of these holidays have rich stories that have much to say to us in our current context. Hanukkah celebrates the Maccabees victory over the Greeks who had forced the Jewish people to denounce their religion, to worship the Greek Gods and banned all Jewish festivals including Shabbat. The Greeks had turned the Jewish temple into a temple for Zeus. The Maccabees refused to follow the Greek laws and waged a rebellion. The first miracle of Hanukkah is that the small group of Maccabees were successful in their revolt against the Greek. The second miracle is the one we are more familiar with – the oil used for the eternal light – a symbol still in use in Jewish congregations today, lasted for 8 days rather than just the 1 day it should have. The celebration for Hanukkah is found not in the Torah, psalms or other portions of the Hebrew Bible but rather in the Talmud. It is also associated, as many Jewish holidays are, with specific foods – namely fried food. Latkes or fried potatoes and fried, jelly filled donuts. Playing the dreidel for chocolate gelt is another fun Hanukkah tradition along with gifts for children. The Hanukkah story is a celebration of freedom after overcoming one’s oppressors. It is refusing to sacrifice one’s faith and identity to the will of the majority. It is a reminder that the freedom to worship and believe as one chooses for many has been challenging and a hard won fight. Even here in a country where we affirm the basic right to worship or not as one chooses we know that we as Americans have not always lived up to assuring that fundamental freedom. All too often some want freedom of religion to mean only their religion. Advent does not so much mark the actual event of Jesus’ birth but rather is a season of hopeful anticipation leading to Christmas. Christmas is actually a 12 day holiday in the Christian calendar that begins on Dec. 25 marking Jesus’ birth. Advent is a joyful, hope-filled season. This reading from Isaiah, which in Christianity is interpreted as foretelling the coming of Jesus as the Messiah, in which the people are longing for a Messiah to deliver them, to save them. The stories of Advent are the foretelling of the coming of the Messiah. A savior that will usher in peace for the Jewish people and the world. The questions for advent are about what are you waiting and hoping for; for what does your soul yearn. This season of preparation in the Christian tradition is not about shopping for presents or putting up the tree, rather it is a preparation of the spirit, a time of joyful meditation and reflection of hope; of the light shining in the darkness. Our reading is a crying out of a people in exile and the prophet pleading for comfort for his people. Many people around the world and in our country are crying out for comfort, for mercy, for relief. Advent asks how will we respond to their cries. All of these celebrations are dated around the winter solstice. It may be easy now with our electric lights to forget how dark winter was and how frightening. There were no crops to harvest, one had to hope that enough had been stored away to last through the cold, long winter. In fact, in Latin … ‘Solstice means the sun standing still.’ As the days got shorter and there was less and less light, it makes sense that people would want to find ways to remember, to entice and to welcome back the light. After all the solstice marks the turning of the year, after the solstice, once again the days grow longer and while many months of winter remain, the days will be brighter and longer reminding us that spring and summer will once again return. Solstice celebrations use fire and candles to welcome back the light, huge bonfires were lit in some places. So what are we yearning for in this season of light and darkness? What seeds are planted deep within in the darkness waiting to take root and burst forth? What is crying out in our lives and in our world for comfort, for relief, for a light to shine in the darkness? Recent events, the regular reports of mass shootings, the crisis of Syrian refugees and raging debate about whether or not we welcome them to the United States, the words of a presidential candidate who would create a registry of Muslims with id cards and not allow any Muslims to enter the country. Much like in our story this morning, we are faced with choices about how to respond to the fear and hate being demonstrated in our public discourse. The number of acts of harassment and violence against Muslims are escalated all over the country. The current rhetoric has tapped into the fear of the other, provided a scapegoat and even if the policies of targeting Muslims and others never come to pass, they give permission to people to incite violence on their own. So as we face the challenges of our time, will we allow ourselves to be converted by a love that will not let us go? Will we find the courage to speak both of love and judgement? Will we spread that love to others? Will we speak words of judgement to those who seek to spread divisiveness and fear? Will be a faith community that shines light and hope into the darkness? As we celebrate this season of light, of hope, of lights in the darkness, how can we respond with love, light and hope to the fear and hatred being sown in our culture. This season of lights calls to us respond with courage and love. 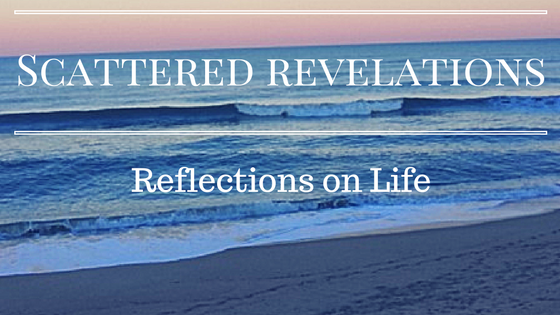 As we reflect on these celebrations of light let us think about what they have to teach us. Let them call us into a deeper understanding and wisdom. Our third source states that our living tradition draws on “Wisdom from the world’s religions which inspire us in our ethical and spiritual life” and our fourth source states “Jewish and Christian teachings which call us to respond to God’s love by loving our neighbors as ourselves” so what wisdom are we gaining? How will these traditions inform our own spiritual practice? So as we read the text from Isaiah of a people crying out for comfort, for deliverance, we ask how are we making a pathway for justice, for peace? How are we preparing not just our homes, but our hearts this holiday season? How will you celebrate? What are your most cherished traditions – spiritual and secular? For me I love sitting in the living room with all the lights out except those on the tree; the small lights of the tree illuminating the darkness. I love our family baking traditions of sugar cookies, fudge and usually a few new items to try. For me the holidays are about being with my family, welcoming back the light and reflecting on the year that is coming to a close. I know that yearning for a smooth, clear path as one year closes and another begins. I know that darkness can seem overwhelming and to be searching for that one small light to keep hope burning. What is it you are hoping for in this season of darkness and light? What are your favorite traditions? Will you put up a tree? Light the menorah? Eat latkes? What candles are you lighting? How are you honoring the communities and cultures of which you are a part this season. During this time in the life of our country, we can sometimes feel overwhelmed with the violence of mass shootings, the loss of life in some communities at the hands of those who are charged to protect us and the rhetoric of politicians that seem to be tapping into the worst of our citizenry’s fears and prejudices … we can feel a sense of powerlessness and hopelessness. However, if we tap into this season’s message of light, love and peace, we may find that we can offer hope in the midst of despair. As individuals, we can speak up in our communities, on social media with a voice that judges what is contrary to our beliefs and offers a vision of hope especially to those who feel outside. As a community, we can support one another in standing for justice, we can offer welcome and sanctuary to those who are being turned away and we can be a beacon of light and comfort in the midst of violence. As a community we lift up and celebrate the diversity of traditions here – Jewish, Christian, pagan, humanist. We seek deeper wisdom and understanding. We come together in recognition of our common search for meaning and for truth. We come together to make justice in the world - work we cannot do alone. So however you celebrate this December, may it be filled with love, joy and wisdom. As JLA said, may we ‘be seized by a prophetic power” and “possessed by a love that will not let us go” so that we can speak truth to power and offer love and comfort to those who need it most.